Why does John Kerry keep saying that Egypt is "Transitioning to Democracy"? 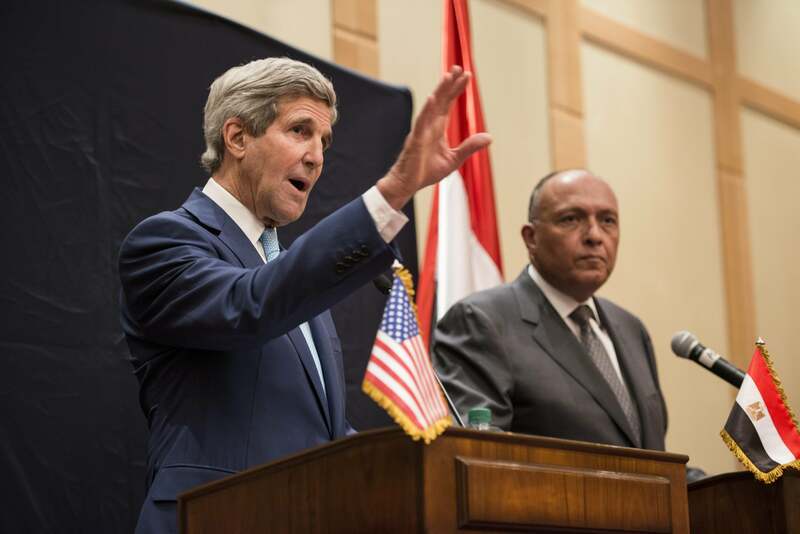 Egyptian Foreign Minister Sameh Hassan Shoukry listens while U.S. Secretary of State John Kerry speaks about Iraq during a joint press conference June 22, 2014 in Cairo. I want to thank the people of Egypt for their hard work in transitioning to a democracy through their election and in making difficult choices with respect to their economy and the future today. Kerry had previously been criticized for referring to the military’s overthrow of elected President Mohamed Morsi as “restoring democracy.” Last month Kerry announced that the U.S. was ready to restore relations with Egypt’s government after having briefly suspended some military aid following a crackdown against supporters of the Muslim Brotherhood. The announcement unfortunately came a day before the sentencing of three Al Jazeera journalists to lengthy jail terms. Though you’ll never hear it in public, most U.S. officials probably aren’t that sorry that, considering everything else happening in the Middle East at the moment, Egypt is once again under the heavy-handed control of a secular (and for all intents and purposes pro-Israel) authoritarian government. Not so long ago, the country seemed on the verge of a civil war of its own. All the same, earlier this week, I defended Kerry from some of the criticism he’s received over recent events. But there’s something Orwellian about repeatedly referring to a government that overthrew its elected predecessor, jails its political opponents and foreign journalists, and conducted a faux election that fooled no one as transitioning to democracy.